Well, I happened by the Starmada forums recently just to see how things were doing with Nova. It looks like the community has diminished somewhat, which I'm sad to see. What's more, several of the threads I skimmed seemed to suggest that Nova has been having the same issues with weapon traits that Admiralty Edition did, namely people stacking all kinds of stuff on one gun and then destroying everything with it. Further, much as we suspected when Nova first came out, fighters have been weakened to the point where they're no longer an effective counter. And naturally, Expendable, Nova's one-shot replacement for Ammo, has been found to be broken as well. I'm starting to see a pattern here. When you let people build their own weapons, things start getting really ugly really fast. It's like True Sorcery in D&D; you build all of your own offensive capabilitites, and if you know what you're doing, you can do ridiculous things. Except that in D&D, there's not a direct contest between players, so you can kind of get away with it, and you have a DM to kill you if you get out of line. In Starmada, where players are directly competing, arms races develop, global optimums are found, the design game is won, and the actual game is over. But, the converse is that designing stuff is fun. So, says I, what wargame do I have sitting around that has buildy options but doesn't permit users to design their own weapons? This mech has a cigar. This cigar is a laser cannon. Your objections are invalid. 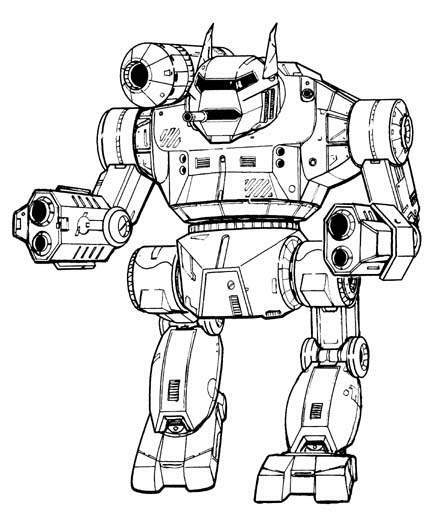 Granted, if I were to run some BattleTech around here, I think I would try to avoid the mistakes I made the last time I tried it, as well as some of the mistakes we made when we first tried to play Starmada and Stargrunt. First off, start people off with 2-3 light to medium mechs, rather than a single assault mech each (one thing Starmada and Stargrunt made apparent is that giving new players a single unit means that when that unit starts getting pounded, they get frustrated, then bored). And second, use a wet-erasable hex-map so there can be terrain (because, as is often said, terrain is an essential part of wargaming... though Matt has this mat, and is out of town ): . Pre-copying a great pile of mech sheets for the classes available beforehand is probably advisable as well, as is making copies of the reference tables (the Stargrunt reference card was fantastic enough that this seems a good plan). Then after a few games with 3025 stock mechs, open up the 3025 design rules with the same tonnage limits (for those unfamiliar, 3025 refers to a tech year in the BT universe, and is the lowest / simplest. There's also 3035, 3050, 3075, and probably more with which I'm not familiar, which add variant weapons and equipment like extended-range lasers, artillery cannons, and giant mech shotguns). And if that takes off, well then maybe we start picking up later tech years. That's how we played BTech back when I played BTech. Stock 3025, then "hacked variant mechs" (like dropping the MG's and ammo for another heat sink, that sort of thing). But to be honest I'm more of an historical wargamer at heart, and I liked the scenario books like "Fox's Teeth". Also, I liked the fiction that mechs were relics to an extent, and though a talented tech could customize on for you, a Phoenix Hawk is a Phoenix Hawk, more or less.